A view of earthen forts constructed at Fort Point during the War of 1812. 9:11 a.m., April 16, 2014–During the War of 1812, American troops built makeshift forts out of soil along rivers to hide artillery and provide cover in case of British attacks. These war relics remain two centuries later, exposed to the elements and slowly wearing away. Geologists in the University of Delaware’s College of Earth, Ocean, and Environment (CEOE) are examining the earthen defensive structures both for their historical value and insights on erosional processes. Delaware Sea Grant researchers have found that an invasive species of Asian crabs is experiencing steep decline as numbers of native crabs are resurging. O’Neal will use modern technology — drones, high-definition cameras and lasers — to conduct topographic surveys and develop three-dimensional models. He and CEOE graduate student Corey Hovanec will focus on three historical sites in Maryland: Fort Stokes near Easton, Fort Point near Centreville and Fort Nonsense near Annapolis. Two drones equipped with specialized cameras will hover approximately 40 meters (130 feet) in the air to take aerial images, providing a visual overview and accessing sightlines that might be otherwise missed, O’Neal said. The forts range in size but can cover hundreds of square meters, made up of parapets mounded high with dirt in geometric shapes and flanked by ditches. The researchers will use ground-based laser scanners to document the contours of the forts from several vantage points at a resolution of less than 1 centimeter, and the data will be cross-referenced with precise GPS coordinates. Soil probes will help determine how much soil from the top of the mounds moved down into the ditches over time. From a scientific perspective, the project will shed light on rates of erosion and the movement of sediment in natural settings. The forts in effect serve as a science experiment set up centuries ago. “Two hundred years ago, people piled up dirt for me and then let it spread back out across the landscape so I could figure out how quickly it moved and what the nature of the movement was,” O’Neal said. 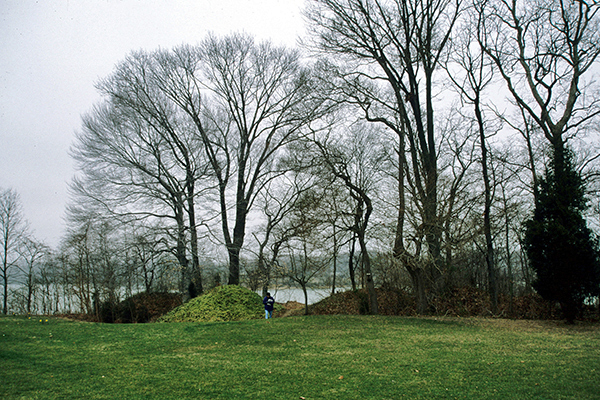 The research could help determine the forts’ original shapes and inform preservation efforts. Like many earthen forts that are not situated on government land, the study sites are threatened by increased development, agriculture, natural erosion along waterways and other dynamics. With sea level rising, some furrows now extend into the water today. Proximity to waterways was strategic during the War of 1812, located at the heads of estuaries to hide cannons and protect towns like Easton during battles. O’Neal’s project will increase understanding of the forts’ construction and use. The scientists will create online maps and informational materials to encourage tourists to visit the mounds and learn about their role in the war. The sites are potential additions to the Star-Spangled Banner National Historic Trail. The work is supported by a grant from Star-Spangled 200 Inc., an organization commemorating the bicentennial of the War of 1812 and the writing of the national anthem. Maryland Gov. Martin O’Malley recently presented O’Neal and others with grants for projects that support programming, education, visitor experience and capital improvements. Article by Teresa Messmore with some material from Star-Spangled 200 Inc. Images courtesy of Michael O’Neal and Star-Spangled 200 Inc.